Soaring temperature and Mid-March – reminds us of comfortable cotton sarees. Before, we make an effort to fish out for beautiful sarees. It’s necessary to keep in mind some tricks to look ‘chic’ and ‘in-fashion’. Cotton sarees, though comfortable are boring! But, challenge lies in how well you accessorize and turn the heads of your onlookers. Keep in mind, the place and occasion, while choosing prints and colours. 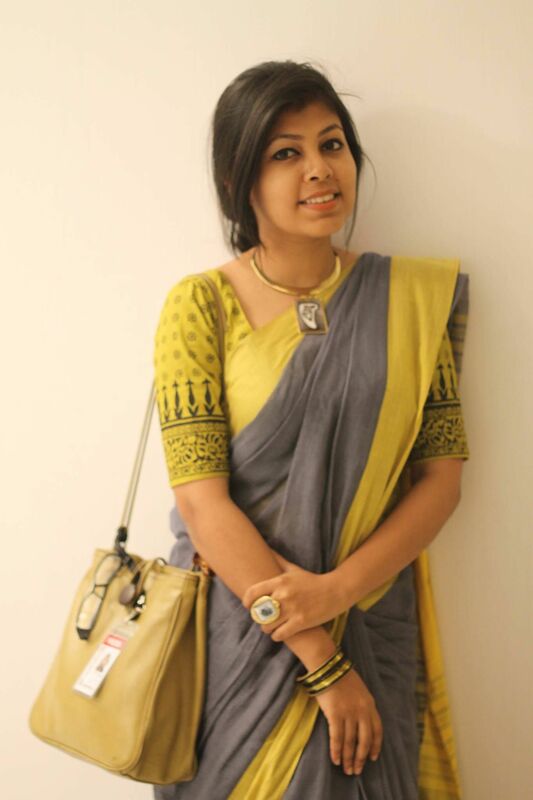 Let me take you through, how to pull off a sober cotton saree without making you look sultry! Have a presentation meeting at your office? Need to head-on for an interview tomorrow? Crisp and freshly ironed simple cotton sarees will not only enhance your elegance. But, also make people look up to you with awe and inspiration. A light mono-colour saree with a bold deep cut blouse will look best on you. This can be jazzed up with floral juttis. Well-moisturised skin, winged eye-liner and fastened or braided hair with a clutch – completes the look! Not to forget the sling bangs to give that oh-so- cool look! Religious get- together or family-visits? Family visits or religious gathering, usually calls-off for an opportunity to meet with old ties. Some may query about your well-being while some may praise your appealing look! Why not be known for the latter than former? We are social animals and we love being the centre of attention. Brown, Red, Mauve and contrast bold prints – is sure to be an attention caller! Keep your accessories minimalistic in case of bold patterned sarees and vice-versa. While hairstyle plays an important role in any look you pull-off. A side braid for short hair and dutch or French-braid for long hair will enhance your look. Lipstick matching your drape, wet mascara added to the bottom of your eye and pearl earrings will make you shine like a diva. Thinking what to wear for your best friend’s wedding? With office and less of time to shop – you must be scrolling the online portals to check the latest sarees with price. In such a situation, you might be left with fewer choices to look best. Leaving with no choice – you might think you are over-priced or the prints are not as per your taste. A true fashionista, can pull off any look as mix ‘n’ match comes handy to them. Neon, Pink, Yellow and royal Blue being rich colours are recommended for bridal occasions. A well rounded black bindi, Kohl smeared eyes and deep red lip-stick gives you the real feminine look! Wavy hair and smooth curves accentuate your appeal in a cotton saree. For accessories – beautiful dokra jewellery or terracotta works well with it! Nowadays online shopping for sarees has made our lifestyle easier and threat to the normal market vendors. Hence, as you have known how to look cool in this hot summer! It’s good you pull off this look and be a true trendsetter among your colleagues or peers.